Tanya Stowe is an author of Christian Fiction with an unexpected edge. She fills her stories with the unusual…gifts of the spirit and miracles, mysteries and exotic travel, even an angel or two. No matter where Tanya takes you…on a journey through time from the Old West to contemporary adventures in foreign lands…be prepared for the extraordinary. Writing Heaven’s touch into earthly tales, Delia Latham puts her characters through the fire of earthly trials to bring them out victorious by the hand of God, His heavenly messengers, and good, old-fashioned love. You’ll always find a touch of the divine in this author’s sweet tales of romance. Delia Latham (a word crafter) and Tanya Stowe (a story teller) combine their special gifts to create heartwarming Christian romance chock-full of inspiration, emotional challenges, thought-provoking dilemmas, happy-ever-after romance—and the brush of angels’ wings! 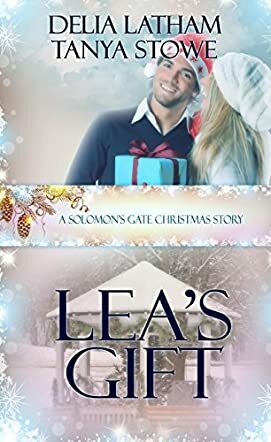 Lea’s Gift (Christmas Holiday Extravaganza) by Delia Latham and Tanya Stowe is sure to become a holiday favorite. It is a story of love, blessings, heartache and joy. Lea Dale is a young woman who has survived a fire as a little girl. She is left with one side of her face scarred and a beautiful spirit. Lea and her parents own the Looking Glass Ranch, a therapeutic camp for disfigured teens, helping them overcome their scars and learn to live and love themselves and others for who they are, rather than what they look like. Lea’s world is completely shaken when suddenly before her stands Laren Meadows, a rich and very handsome man, who wants to spend some time at the camp and possibly invest in the Looking Glass Ranch. Lea falls instantly in love with him and Laren appears to be deeply attracted to Lea. Latham and Stowe have written Lea’s Gift with feeling and compassion. I instantly fell in love with each of the characters and hoped for a happy ending. This book is only eighty-four pages but it is stocked full of Christmas miracles and love. It was impossible to put it down, but I hated getting to the last page and leaving my friends behind. Lea’s Gift would be a perfect Hallmark Special Christmas tradition to watch year after year after year. I cried, I laughed, and I cheered and booed as the story unfolded. I highly recommend this book to everyone; it is a beautiful reminder of how we should treat each other, what is really important on this earth and just a lovely story. I give this book a five star plus, plus, plus rating. I urge you to read Lea’s Gift; you will not be disappointed. I love meeting Solomon, the angel in Ms. Latham's stories! He's like that first warm, spring wind, or the streetlight when it's just too dark, or the smell of coffee when you just wake up...you know what I mean...he's just what you need when you need it! And that's just what he is to Lea - just what she needs for guidance. This is such a sweet story! With a twist that will throw you as much as it does to Lea. This story made me smile at times, and grow teary eyed at others. Wonderful, wonderful! Don't miss this one! This book touched my heart with the main character and the children who visited Looking Glass Ranch. It made me feel good! loved this book! I read in over a busy holiday and regretted each time I had to lay it aside for chores. It's written from Lea's point of view and her thoughts, emotions, and experiences draw the reader into the frontline of the story. We all think we want a certain gift but when we actually get it, we realize we don't want it. In this story, Lea receives many gifts, and she is a gifted person. She helps physically challenged children with her God given abilities. I love Solomon. He's the angel who appears in many of Latham's stories, and I never get tired of hearing from him. This is a delightful and easy read. I devoured this touching story in one sitting. Delia Latham and Tanya Stowe have a gift for storytelling like no others. I love everything they've done. This was a very good book. No matter what physical problem you have, there is that special someone out there that will love you unconditionally. I love this book very much. It's gives a person hope and teaches that no one is perfect in the world. We have to except people under any conditions.